A. The provinces that formed the Dutch-governed commonwealth on the North American continent have names drawn from the "Old Country," meaning the European Netherlands as well as Flemish sections of what had once been called Belgium (the southern half of Napoleon Bonaparte's short-lived Batavian Republic). The American provinces, grouped in a union called New Netherlands, also were joined in a wider confederation with the Dutch Antilles, Surinam, and the Old Country. This incongruous entity was called The Kingdom of the Netherlands. Each country, however, was for all practical purposes autonomous, except for sharing the limited hereditary monarch from the House of Orange, such as was done with the last British royal family, the Windsor-Mountbattens, of the British Commonwealth of Nations in previous centuries. The New Drenthe-New Orange line provided the Holland American border with a short-lived Aztekan Indian Empire centered on what had been Mexico and the U.S. southwest. The Dominion of Canada had disintegrated entirely long before in ANNO 2024. New Friesland occupied a southern portion of what had been British Columbia and continued down into the inland sea of the Puget Sound region. Oregon, as well as Idaho, Montana, Wyoming, North and South Dakota, Iowa, Tennessee, Kentucky, West Virginia, Alabama, Georgia, Florida, Michigan, Ohio, Vermont, New Hampshire, Massachusetts, Connecticut, Rhode Island, Maine, and most of Wisconsin, Illinois, and Indiana have been abandoned by the 23rd Century A.D. Abandoned areas were not necessarily uninhabited. Native Indian cultures, even Caucasians turned "White Indian" and banditti and living in tribal fashion, patroled wildernesses that encroached on every province. Unwieldly and thinly-populated, incorporating a most unDutchlike topography, the Durnia), New Groningen (Upper Midwestern states), New Flanders (Alabama), New Utrecht (Kentucky, Tennessee, Pennysylvania), New Nassau (Florida), New Overijessel (from former Lake Michigan to North Holland). These are approximations, as the provincial and state boundaries did not coincide at all points. Also, nebulous southwestern regions such as "New Oostriesland" existed only on paper after a horde of half-breed bandits and footpads from the Land of the Plumed Serpent swept north and pushed out both Dutch and English forces. There was no real consensus at the time of the formation of these ephemeral provinces just exactly where the boundaries lay, and shortly it did not matter as they dropped from the commonwealth and were left as they were, howling wildernesses, though not necessarily uninhabited. A few rail and airship lines from east to west were kept open but travel was precarious and increasingly expensive as the economy declined, taking technology down with it. B. Chief cities of Holland America were: New Amsterdam, New Amsterdam, New Antwerp, New Antwerp, Minneapolis-St. Paul (commonly called Minnpaul), New Zeeland, Reno, New Limburg, Hollywood, New Orange, and Atlantic City, New Gelderland. New Amsterdam, the chief city and port, was the capital of Holland America until the breakup of the country. All these cities fell victim to downward spirals of economic decline and depopulation, and when one city was abandoned the people fled to another, until finally New Amsterdam was the only functioning city, which in turn shrank to an island village. C. Until its dissolution in the 25th Century, the capital of the Kingdom of the Netherlands remained Amsterdam in European Netherlands, with an uncrowned monarchy residing at the seat of government in The Hague. Other capitals of constituent Dutch states were New Amsterdam, New Amsterdam, Kingston in the Netherlands Antilles, and Georgetown in Surinam. Holland America, The Netherlands in Europe, and Surinam, extremely depopulated, soon faded out of existence entirely. The Netherlands Antilles with its capital at Kingston, Jamaica, fell to an Anglicized Jamaikan overlord and lingered on as a capital of a short-lived "Empire of Jamaica and the Argentines." The province was chief among the North American provinces of Holland America. The American States-General, the two chambers of government, were located in the city of the same name. The Kingdom of the Netherlands, to which Holland America belonged, was a constitutional monarchy, with an uncrowned monarch. The titular ruler of the Dutch state still resided in The Hague in the European Netherlands. This peculiarity should be borne in mind when dealing with the New Netherlands or Holland American capital, New Amsterdam. No Netherlander, American, European, or Caribbean, would have considered New Amsterdam the king or queen's residence, simply because it was only the capital of one of the constituent parts of The Netherlands. Sister capitals were Kingston on the island of Jamaica in the Netherlands Antilles, Georgetown in Surinam, and Amsterdam, in the European Netherlands. New Amsterdam the province, to some extent, followed old boundaries of the long defunct New York State, but the extreme shrinkage of population and cultivated lands made the province only a shadow of what had been. The Dutch American inhabitants, however, have no idea they were subsisting in a "shadowland" and accepted it as normal. New Amsterdam was bordered on the east by the abandoned former U.S. of A. states of Connecticut, Vermont, and Massachusetts, on the northeast by abandoned Maine, on the south by abandoned Pennysylvania and the province of New Gelderland. Effectively, the province was connected to the rest of Holland America by only New Gelderland on the south and westerly via Lake Ontario, renamed Lake William, and other Great Lakes to inland Northwestern provinces of New Zeeland and New Antwerp. New Amsterdam consists of three regions: the islands of Anne Marie Island, Victory, and Freedom (formerly Long Island, Martha's Vineyard, and Nantucket, respectively), a portion of mainland Connecticut up to Gape Gosnold (formerly Cape Cod), and strips of land east and west of the North River, from New Amsterdam at the mouth of the river to the villages of Antwerp and Carthage to the north. The Bosboom-Toussaints (formerly Berkshire Mountains) provided the eastern boundary, New Gelderland the southern. The province included the Kaatskill Mountains and extended westerly to towns once known as Syracuse, Homer, Ithaca, Troy, and south-easterly into former Pennsylvania to Lebanon and Oxford and terminating at Smyrna (in former Delaware). New Gelderland extended from Cape May to a point just beyond what was called Staten Island, ran north along the Hudson River to the north-eastern corner of former Bergen County, then ran to the extreme northwest corner of former Sussex County before turning southwest. When the Dutch conquistadores to the north extended Dutch sovereignty from sea to sea, the way was open to an expansion of a greater Mexico. Indian peoples, now in the majority, finally gained the upper hand over the long-dominant Mestizo and full-blooded Spanish element and Mexico City changed name to the old Aztekan placename, Tenochtitlan, capital of a revived Indian empire called the Land of the Plumed Serpent (LPS). For a brief time this empire, with Plumed Serpent of Quetzalcoatl andTenochtitlan and Tula as capitals and ceremonial centers, pushed north and nearly divided in half the over-extended Dutch union, but then was too weak and itself over-extended to reach any further than New Limburg. 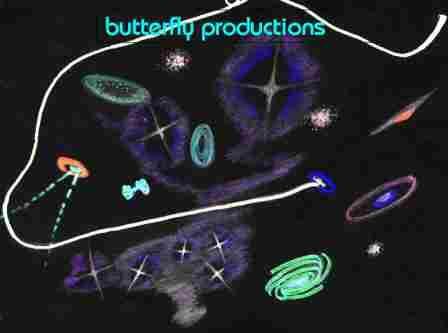 Yet LPS territory included on its northern border with Holland America the formerly named states of New Mexico, Arizona, and Texas--states forming the ephemeral "New Oostriesland." Most of Nevada and Utah were also included in the revived Aztekan Indian empire. Its southern border ended down at near the terminus of Central America, in the increasingly silted up Panama Canal, over which the LPS held control and exacted stiff customs charges on the dwindling canal commerce until the Indian monarchy collapsed. Always weak, the LPS vociferously claimed but could not militarily seize the Netherlands Antilles, New Drenthe, New Flanders, and New Nassau. 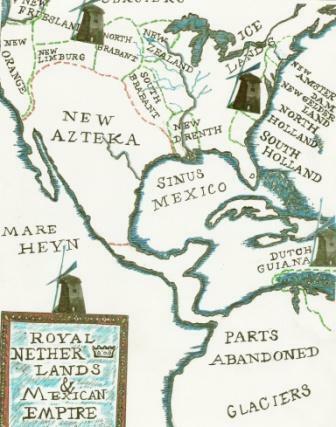 The southern Dutch provinces, according to the leaders of the LPS, were the original Aztekan homeland of Aztlan, from which they had immigrated to the Valley of Mexico. Every year banditii from the LPS spread further north into Dutch territory, but government control was unable to follow up, and they were unorganized and often profitless raids, not military conquest. The English, in the person of an Anglo-Jamaican dictator, took over the Netherlands Antilles and its capital of Kingston when London was abandoned in the early part of the 25th Century. By that time the Land of the Plumed Serpent and Holland America had come apart economically and denationalized. Tribal societies took over whatever territories they could still control with their declining numbers. Henry Hudson, an Englishman with the the Dutch East India Company, in 1609 reported the discovery of a promising territory between Virginia on the south and New France on the north and sailed up the North River (which the English came to call the Hudson). The region remained under Dutch East India Company governance for only three years. After that Dutch leaders of New Netherland were company men appointed by the West India Company, Amsterdam, The Netherlands. Dutch leaders of this period were often venal, grasping, irasible, incompetent, and sanguinary. Director General Willem Kieft put an Indian squaw to death for stealing peaches from his tree, and he also aimed to exterminate whole Indian tribes. The colony attacked neighboring colonies at peace with the Dutch, leading to recalls, massacres of both Indians and Dutch, wars, and economic dislocation in an otherwise prospering colony. Though agriculture and animal husbandry were very important in the city and its environs, chief industries were shipbuilding, brewing, baking, and naval provisioning, in adddition to which the provincial capital enjoyed the "staple right," or right to collect customs from passing commercial craft ascending or descending the North River. Stuyvesant, though irascible and autocratic and opposed to democratic assembly and reform, proved conscientious and devout, seeking to provide the province with honest and effective administration. He had performed ably as the governor of Curacao in the Netherlands Antilles. As New Amsterdam director-general he appointed the city burgomaster, five schepens (aldermen), a shout-fiscal (a high sheriff), and secretary. A city tavern built by Kieft was remodeled and made the stadt huys (town hall). At a banquet given to the governor on December 8, 1654, he presented the city burgomaster with the painted coat of arms, seal, and silver signet of New Amsterdam. The seal comprised the arms of old Amsterdam, three crosses saltire, with an added beaver or a crest. Underneath was the legend, "Sigillum Amstellodamensis in Novo Belgio," bordered by a laurel wreath. On a mantle above were the letters G.W. C., for "Chartered West India Company" to which Manhattan Island belonged. The city received much improvement in street paving, fire prevention, transportation facilities and Long Island ferry toll regulations and rates, with an area, New Haerlem, set aside for agriculture and community amusement. Other events of Stuyvesant's administration were a defensive wall and ditch with palisades and a breastwork extending from the North River to River Hellgate (East River), creation of two privileged, chartered orders of burghers, a failed attack on Swedes on the South (Delaware) River, a truce with invading hordes of Indians, and denial of religion to Lutherans. By 1660 New Amsterdam contained 350 houses, chief among which was Governor Stuyvesant's town house south of the fort on waterfront property. His country estate of 300 acres, formerly the West India Company's Farm No. 1, cultivated by 300 tenant farmers, was called "Stuyvesant's Bouwery," or simply "The Bowery." Its apple and peach orchards were a source of fresh fruit, apple cider and peach wine. The colony, nevertheless, was weak militarily and, taken by surprise, fell with no resistance to an English war squadron on demand, who at that time were at peace with The Netherlands. New Amsterdam and New Netherland renamed New York. New Amsterdam renamed New Orange and the province renamed New Netherland after seizure by Dutch fleet and Admirals Evertsen and Binkes. The capital city and New Netherland restored to the English by the Treaty of Westminster, February 9, 1674. The names of capital and province were changed from New Orange back to New York. The American Revolution broke out. Eighteen cases of tea were dumped into the harbor from an English ship. After many reverses, New York was liberated. After New York was liberated from the English and the peace treaty signed, General George Washington rode down Broadway into the city on Nov. 25, 1783 (New Yorkers celebrated November 25 as Evacuation Day thereafter). New York kept the English name and became the national capital in 1785 under the confederacy of colonies and the meeting place of the first United States Congress. New York lost the Capitol to Washington, D.C., but the United Nations Headquarters was located in the city. Later, with the disbanding of the United Nations, the World Union located part of its operations in New York on the old United Nations' site, which had orginally been the old Turtle Bay Farm along River Hellgate. Re-settlement of Manhattan and adjacent islands and mainland, with vandalism directed at all vestiges of former English administration, and the name changed from New Orange ("New York" was not recognized as legitimate as it had been in the revoked Treaty of Westminster) to New Amsterdam, so as not to be confused with West Coast provinces, North and South New Orange; growth of municipal and governmental institutions; the Treaty of Westminster formally renounced; boundaries of Dutch provinces drawn; newspapers published; canals dug to enhance commerce. On at least four occasions New Amsterdam was seized by English forces and renamed New Sutton and sometimes New Clarke; but the usurpations and changes of administration were so temporary that the name change from New Amsterdam to New Clarke or New Sutton, with shifts in government organization, meant next to nothing. The Dutch governments in exile on outlying islands, during such brief English interludes, carried on most business as usual through intermediaries or factors in the city. Terms of service by the governors are given in full without needing to reflect ephemeral English occupations. The Dutch Joan of Arc led Dutch forces in decisive campaigns driving out English from New Amsterdam; retired from office to deal in the following decades with English forces in other provinces of the country; holiday named in her honor--"Anne Marie Day" celebrated May 5 with a parade led by the schlepens (aldermen-city fathers) with a young maiden chosen to represent A.M. G. B-T, riding in a gilded carriage just behind the schlepens; B-T's likeness was carved beside a series of monolithic stone figures in the Dakota mountains in the hinterland; a major New Amsterdam island was named after her; her battle standard, the Rose of old New Netherland/New Amsterdam and New York State was adopted as the official New Amsterdam flower and incorporated in the provincial flag, signet, and Great Seal. An equestrian sculpture of Commander Bosboom-Touissant was commissioned by the schlepens. The same sculptor who dynamite-carved the Black Hills-Mount Rushmore figure of her was employed. The sculpture portraying her as a young woman in battle dress slaying a dragon was erected after a ceremony with parades and festivities in the square before the Capitol Building, Town Hall, and West India Company. A commemorative guider was supposed to be struck by the Dutch mint, but it proved beyond the capability of the Treasury�s stocks of either gold or silver. Son of A. M. G. Bosboom-Toussaint, founded University of New Amsterdam and promoted the arts; failed to rebuild collapsed New York City triborough bridges; also attempted restoration of several miles of subway train line, but the leaking of water into the tunnels forced the abandonment of the daring project, which was too expensive anyway and sank the city deep in debt. Swept into power by riots, reacting to outbreak of plague and a bankrupt treasury, the government began reforms. He instituted stringent Moon Day blue laws and policies of temperance; eliminated free university tuition and cut off state support of the university as a fiscal reform; after refusing the schlepens' annual Anne Marie Day parade in May, he was removed from office for sheer obesity (he weighed in at over 24 stone while standing less than five feet tall) and extravagant refurbishing of the governor's mansion. Revived Cuyp reforms; used provincial militia to reduce neighboring Indian tribes to forced labor; responsible for igniting first Indian wars that devastated upper New Amsterdam; caused rupture in relations with Netherlands Antilles by seizing and impounding any ship bringing in Jamaican rum; forced to retire after one term after he was charged with taking bribes from English interests. A notable reformer, he rebuilt churches, hospitals, poorhouses, lunatic asylums, orphanages, the penitentiary, and almshouses let go to ruin; cleaned major canals; failed to close illegal saloons and shut down thriving numbers rackets; and published a book of visions he claimed were divine messages, which warned of the imminent breakup of the Dutch commonwealth and the triumph of barbarism; vanished mysteriously after leaving office. The day of his disappearance an Indian shaman, or wiseman, appeared in the city, garbed in travel-worn buckskins, obviously come a long way. Captured, he testified that he had only come to bring cheer, saying that he had good words for the whiteman from the lore of his people, with special healing herbs and the dance that worked the magic of the herbs most powerfully into man's heart and limbs, however ill he might be. He then related the account of Nanabush the Great Hare and the Medicine Dance (see Table 5; Nanabush was known by many names, such as Glascoop, Manabozho, Wisaaka, Chi-li-wah; he incarnated primal energies of nature, invented many useful things for mankind, and was subtle and devious and selfish as well at times). The well-meaning shaman was put in prison, more for his own protection than for any offense. Being Indian, his venerable age and noble bearing were disregarded and he was beaten very badly by the common thugs and numbers racketeers who had refused to give city administrators timely pay-offs for immunity from prosecution. He would have been killed but he escaped by climbing the wall as only an Indian could and was last seen hurling a curse at the city for its rough treatment of an emissary of good will from the peoples of the Great Hare in the western plains and deserts. As for the special medicinal herbs he had brought to save the city's people from a terrible sickness he warned was coming, he threw them in the River Hellgate (East River). Major outbreak of plague causing over 3,000 fatalities and a meteor shower occurred. Failed to conscript Indian tribes to perform factory work and keep basic city services running; removed from office after audit by Lubbertus van der Dincklagen, Fiscal Officer for province. Invited immigration from failing European nations to increase manpower; cleaned city canals neglected in Anglo-Dutch and Indian wars and during lax or corrupt administrations, created city park system, planted buttonwood trees and tulip beds along major avenues, built outdoor ice-skating facility; was assassinated by unknown assailant as he was announcing he would seek a second term and continue his liberal "Open Door" immigration policy to rebuild the waning population and increase productivity. Plague struck again causing nine thousand fatalities, wiping out any gains made by the immigration policy; meteor shower. Wealthy and influential North River patroon with large New Amsterdam brewery interests and ties with London and Reno casinos and clubs, was challenged with impeachment for widespread civic corruption, but nothing could be found amiss in his records by the Fiscal Officer. He renamed Bosboom- Toussaint Island Van Kieft Island, but a riot insued that forced him to rescind his decree. The buttonwood trees were cut down during his administration to furnish lumber to build his summer cottage. His son Franke Lynn van Kieft was elected Stadholder for New Netherland, and numerous equestrian statues of the elder and younger Kieft were erected in New Amsterdam squares and other public places at public expense. English interests began buying up Dutch manufactories, mills, and major hotels during his adminstration. The sugar refineries Van Kieft had built on Bosboom-Touissant Island were bought by the English at that time, but were shut down, probably because of competition with English refineries built previously in Jamaica where labor was cheaper and relatively abundant. Continued bad economic times and population decline, riots by jobless, and acts of vandalism. Records were lost from ANNO 2361 on in the catastropic Great Fire of New Amsterdam. ANNO 2410, a cow kicked over a lantern in a straw-filled livery stable and from there a fire spread that engulfed the capital; a firestorm destroyed everything, old and new portions on Manhattan, and by way of the ancient, long unused network of tunnel roadway and rail lines burst out on adjacent boroughs and consumed them as well; the Great Fire forced an evacuation to the boats and ferries, and then, those who did not flee New Amsterdam altogether, took shelter with the tiny Italian colony on Ellis Island, where at last report an unincorporated village of fishermen and oystermen subsisted called Little Sicily. The eerie, ruin-littered, oozing swamps of Manhattan, retaken by Indians, was called "Qukkwn Cwegykarm," thought by some to be a phrase from the extinct Weckquaesgeek Indian tribe meaning "Never Again Paleface's City! The last Weckquaesgeek, the old chief, uttered the curse as he died from a white man's bullet." This imprecation compares closely to the Aramaic "Avada kedavra," meaning "May the thing be destroyed," which has corrupted in transliteration to "Abracadabra." Some details about the Fable: The central personage of the Shos-Shone shaman's account is the Great Hare, variously called Nanabush, Glascoop, and many other names depending on the tribe and region. The very multitude of names suggests the wide popularity of this perspicacious cult of the Great Hare. His most pronounced feature, it seems, other than his shrewdness in times of adversity, has to do with the healing arts. Perhaps that chiefly explains his popularity among the North American tribes, since they were responsible for finding and cultivating the herbs that sustained their lives during outbreaks of plague. It is most remarkable that the Shos-Shones, apart from the other tribes that still existed, sought to share their herbal expertise with their enemies the whites instead of seeling it for a high price as others had done. Perhaps they, more than others, had truly entered into the kindly, benefactor-spirit of the Great Hare. Obviously, taking into account his actions, the Hare cared for everybody. Even if he dealt harshly with the underwater panthers, it was because they deserved to be punished for slaying Brother Wolf. This account, then, is totally the opposite in outcome when compared with Bayre's Hare and Jaguar. Only the native peoples of the Americas could imaginatively invest the weaker of the two with irresistable powers in the struggle, so that the jaguar (the underwater panther) comes out of the contest utterly vanquished and sueing for peace. Obviously, this particular Hare had to be something far out of the ordinary, and he compares very favorably with the best of such contestants in AEsop's Fables and even excels them in some points, namely, general nobility of his character. Nanabush returned from hunting to find that Chibiabos, Brother Wolf, was missing. He was afraid that enemies had slain Chibiabos or hurt him badly so that he could not crawl home, so he went looking, far and wide. He questioned every bird and animal he met, but they all seemed to speak with forked tongues and he learned nothing. White Raven was the worst and trickiest of the lot, and growing angry, Nanabush held him over a fire to get the truth. That always worked, the Hare knew from experience. Scorched black, Brother Raven confessed he knew what had happened to poor Chibiabos. The great panthers that hide in lakes and streams had killed Chibiabos without pity, the Raven said, blinking away a raven's tear. With grief and rage, Nanabush dropped the bird, which now was permanently black as night, and went off to look for the killers. He found the big rocks by the falls of the river of the laughing waters where the monsters often came out and sunned themselves. Catching some, he slew them. The others pursued Nanabush by sending forth a great flood that engulfed the whole world. Only by climbing the tallest pine tree in the mountains to the west did Nanabush escape the terrible fate of drowning that befell most all the other animals. Evenso, Nanabush had to use magic and lengthen the pine tree as many as four times so he could keep his nose above the flood. It was a dreary place to spend his days, however, Nanabush soon found. Everywhere, in every direction he turned, was water, nothing but water with tree trunks floating helter-skelter. Seeing movement in the water one day, he found it was Brother Beaver, who didn't mind the flood at all; in fact, it had torn up a lot of saplings for him to chew on without his having to work hard to fell them first. Brother Beaver just then was trying to figure out how he was going to dam THIS flood. He could see it was going to be a big job. Just then Nanabush interrupted the beaver's thoughts by begging him to dive down and get him some earth. He only wanted to see his mother the earth again and then he would gladly die, he told the beaver. That sounded like a very fine idea to the beaver, for in his heart he did not like Nanabush very much--the Hare was really too clever for his own good, the beaver thought. So he dove immediately and must have underestimated the depth of the flood, for some time later Nanabush looked out and saw Brother Beaver's lifeless form floating on the water. He was bleeding the nostrils, so the Hare reasoned he must have drowned. A beaver, drowned? It was news to him, but there was the proof. Stupid fellow! he thought. He used a little of his magic. He blew on the beaver and restored him to life. The beaver was very surprised and took off swimming as fast as he could, without a glance back at his benefactor. Then the Hare looked for a better swimmer to do his little errand. Eventually, he was rewarded, for Brother Muskrat came by, looking pleased with himself, for somehow his efforts had paid off and the Great Spirit had rewarded him by turning the whole world into a beautiful stream of water he could swim in forever without touching shore. There were plenty of trees and brush floating around for him to climb into when he was tired swimming. It was perfect, the muskrat thought. Nanabush made the same plea to the muskrat. The muskrat was touched in the heart; he really wanted to help Brother Hare. Down he plunged, but he too came floating up bye and bye, and Nanabush had to revive him with a blow of his magic. Yet all was not lost. Nanabush found a tiny bit of earth in the paws of the muskrat. He blew on it four times. At each breath the dirt increased at such a tremendous rate there was soon enough land for men and animals to live on once again. Thus the panthers that live underwater were foiled by Nanabush the Great Hare. A condition of the peace treaty was very helpful to animals and men--for Nanabush was powerful enough to dictate the terms of peace. The panthers had to teach Nanabush all they knew of herbal remedies and how to perform thetch Commonwealth evidenced steady decline and would drop out entirely from the community of nations, itself rapidly shrinking to less than a handful by the 25th Century. A bitter civil war fought by "Wets" and "Drys" or between forces supporting or opposed to the Dutch temperance laws broke the back of the commonwealth--which had never been homogenous nor wealthy. With temperance forces victorious, Reno was shut down, and that vital economic link between east and west coasts and linchpin for the money economy was gone forever. The collapse of the Dutch in North America and Europe was complete by the 25th Century, briefly leaving Surinam (formerly Dutch Guiana in colonial times) and the Netherlands Antilles as the surviving Dutch-federated states in the Americas. A valiant but unworkable experiment had failed. Provinces abandoned by the government of Holland America by the late 24th Century were (west to east): New Batavia (formerly Oregon), North New Orange (formerly northern Califo Medicine Dance, the Midewiwin. Before Nanabush was able to blow on dead animals and restore them to life, but his magic was limited; he probably couldn't do it for everybody, nor did he even try. As for healing everybody, that too was beyond his powers. But with the knowledge of the underwater panthers gave him there was now no telling how much good the Great Hare could do for animals and men. Many Indians could not keep this to themselves. They thought everybody ought to know that Nanabush is prepared to help him, sick as he may be. Even if he is dead, Nanabush can restore him to life. Those who dared--usually old men whose lives did not count much in their own eyes--went to tell their enemies the palefaces who were still in the land. But there was more than herbal remedies and the Dance. The Great Hare restored Chibiabos to life, but since he was still a wolf and had a wolf's untrustworthy nature (from the Hare's standpoint), Chibiabos was made guardian of the Land of the Dead in the west. No one knows what Brother Chibiabos thought of the arrangement, only that he went and did as he was told. As for men, Nanabush went about teaching men the great Dance of Life, to as many of them as would learn it. Physical Geography of the Maas River presents problems that cannot be resolved: whose river was it? Formerly of The LPS, on the strength of the Spaniard Estevan's sighting of the Hudson/North river in 1525, this effluence of not modest East Coast proportions was not discovered by Henry Hudson until 1610, a Johnny-come-lately who struck his flag down in the river and upon adjacent territories. This claim, like so many others by the LPS, proved a puff of air.